Caption: A rotating Neptune as seen through the eye of NASA's Hubble Space Telescope. The planet is exhibiting and increase in brightness and in the amount of clouds observed in the planet's southern hemisphere. 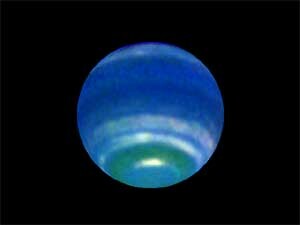 The changes suggest that Neptune is undergoing seasonal change. Caption: A time series of images of the planet Neptune taken by the Hubble Space Telescope illustrate increasing cloudiness that is a hallmark of seasonal change. The growing bands of clouds in the southern hemisphere of the planet suggest seasonal change. Because the planet takes about 165 years to orbit the sun, the seasons on Neptune last more than 40 years.